It snowed in Dickson can you believe it?! It started snowing the night before, big HUGE beautiful snow flakes. I am in the 1st counselor in the YW Presidency and after all the leaders made it to mutual the Bishop canceled all activities for the evening. LOL! All the kids were so excited to have snow. Everybody, including my niece Preslee and my mom slept with their pj's inside out in hopes that we'd get a snow day the next day. No such luck, and by 10 am the snow was gone! Sarah and Emily were the only two that got to play in it and their playing time was brief because we were on our way to preschool. 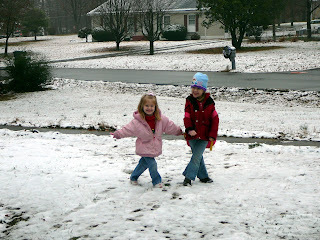 We are hoping that it will snow again so all the kids can play in the snow at least once this year. I do miss the snow from Ohio. I have great memories of sledding with family and friends, making snow men and even igloos! When my family lived on Alton Rd. in Galloway, OH my sister and brother and I made an igloo it was called "Fort Wanna Wanna Heater"!! Seriously, when are you going to post again?